Gravlax is very simple to make, and the homemade always tastes so good. I use only 4 ingredients (besides salmon) for my gravlax; salt, pepper, sugar, and a lot of dill. 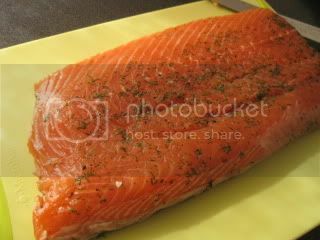 I don't have time today, so I will post my gravlax recipe next time. Here's my gravlax, after 24 hours. 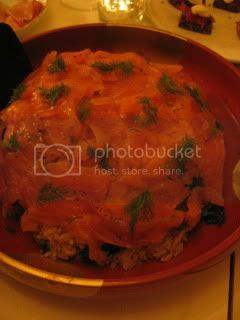 The fish was washed off of salt and most of minced dill. So nicely shiny. 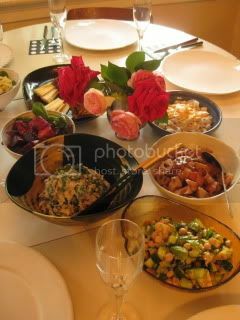 One evening, I was invited to a potluck dinner at friend's house. I made gravlax chirashi sushi. I was so glad everybody seemed to have enjoyed it! 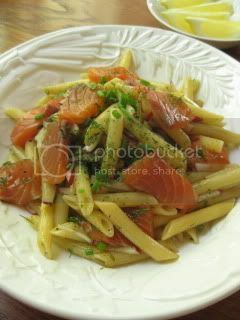 The next day for lunch, I made cold penne with sliced gravlax. Because gravlax already has very nice flavors, the pasta was seasoned simply with olive oil, salt, pepper, and some ao-nori (aromatic nori seaweed flakes). The dish was served with a lemon wedge. Beautiful taste.